Beijing 2012:Audi RS Q3 concept | What Car? 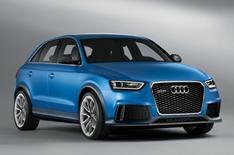 The Audi RS Q3 concept car has been revealed ahead of its official debut at next week's Beijing motor show. The RS Q3 is a high-performance version of Audis Q3 SUV. Setting it apart from the standard car, Audi's RS Q3 concept gets beefier bumpers and wheelarch trim, and a large rear spoiler. Theres also a rear diffuser, large front air intakes and a lower front grille that's embellished with quattro lettering. The concept car is finished in matt Ordos Blue paintwork, which has a subtle yellow tint. There are tinted front and rear lights, and the headlights have carbonfibre-reinforced polymer (CFRP) inserts. This CFRP is also used for the bumper trim and door mirrors, while the side windows have matt aluminium surrounds. The RS has been lowered by around 25mm, and rides on 20-inch alloys that have a contrasting gloss and sandblasted finish. RS Q3 badging appears throughout the interior and exterior. The blue and black colour scheme continues inside, with black leather seats and instrument panel offset by blue Alcantara door trim and seat panels. Power's provided by a 355bhp 2.5-litre 5-cylinder turbocharged petrol engine, which can thrust the RS Q3 from 0-62mph in 5.2 seconds and on to a top speed of 165mph. The RS Q3s four-wheel-drive system has a variable front-to-rear torque biasing function to give maximum traction, and theres a seven-speed S tronic automatic gearbox. Audi says there are no plans to put the RS Q3 into production, but the concept cars showroom-ready looks could suggest otherwise. Although Audi usually launches RS models late in a models lifecycle as with the RS4 Avant the RS Q3 could feasibly go on sale as early as 2013.